Thank you, Tammy, Cecile and Therese for leading me to this wonderful story from the Wall Street Journal. TACLOBAN, Philippines—Typhoon Haiyan wiped out a lot of businesses when it barreled through this port city in November, including Rosita Imperial’s 27-year-old beauty salon in a downtown shopping mall. Just eight weeks later, she opened a new location in a tiny storefront across from a funeral parlor. By February, her receipts were almost back to where they were before the storm. The quick turnaround in Ms. Imperial’s business is a reminder that for all the devastation in Tacloban—more than 2,500 of its 220,000 residents were killed—many residents are finding ways to rebuild some semblance of their former lives, despite long odds. Much of the city still lacks electricity, while construction snags have slowed a government push to relocate displaced families in semipermanent homes. More than 12,000 businesses are idled or closed for good. Some Filipinos have questioned whether Tacloban will ever fully recover. But some residents, through a combination of ingenuity, grit, and raw necessity, are getting on with their lives. Dozens of banks and restaurants have reopened, and hundreds of small street-side stalls have sprung up. In some cases, store owners such as Ms. Imperial are getting a boost from residents seeking simple pleasures that remind them of life before the storm. 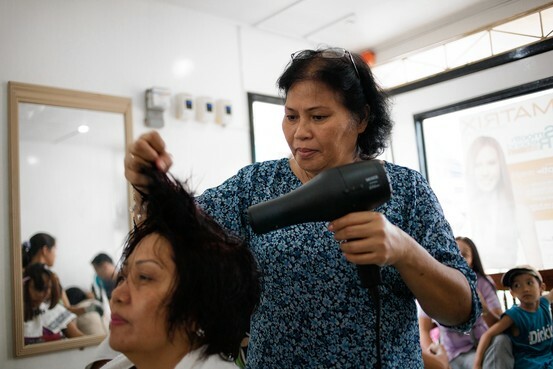 “People still go to the salon because when they look at the mirror and find themselves looking haggard—that will add to their problems,” said Eunice Julian, a 59-year-old retired civil servant and longtime regular at Ms. Imperial’s salon, after walking in for a pedicure. Ms. Julian’s husband of 32 years, Oscar, died from medical complications caused by diabetes four days after the typhoon. She believes he would still be alive if proper medical care had been available at the time. “It feels good to come here and meet friends,” she said. By her own admission, the 57-year-old Ms. Imperial, known as “Rose” to her clients, and her family were among Tacloban’s luckier residents. Her house survived the typhoon with only its roof blown off. But her “New Rose Salon,” previously housed in a dank, aging shopping mall downtown, was trashed by churning storm waters. When Ms. Imperial returned a day after the storm, she found the floor caked with putrid sludge, furniture smashed, appliances useless, and her stock of hair products all but washed out. New Rose Salon had been her life. It helped raise her three children and two nieces, and paid for her house. And, as she soon realized, others in her community also had a stake in the salon. A month after the typhoon, Ms. Imperial received a call from a friend and regular customer. “I’d like to get a manicure and have my hair colored. Could you come by my office?” asked the friend, Carmen Soan, Ms. Imperial recalled. The beautician promptly agreed. Caring for one’s appearance is “a way of moving on from the typhoon,” said Ms. Soan, an administrative officer at the Department of Health’s regional office in Palo, a neighboring city of Tacloban. “My white hair was starting to show and my nails were getting very dirty,” she said. Soon after that, Ms. Imperial said, requests for house calls started rolling in, roughly two to three times a week. Encouraged by the demand, she pushed harder to reopen her salon. Failing twice to secure relief funds from a Taiwanese charity, Ms. Imperial in mid-December turned to the Perpetual Help Credit Cooperative Inc., a local credit union, and borrowed 20,000 Philippine pesos ($450). Every penny would go toward rebuilding her salon, because she “couldn’t spare a thought for anything else,” not even her damaged house, she said. Ms. Imperial then found a new storefront—a rudimentary 3-by-3-meter space alongside a busy street in downtown Tacloban near an upmarket hotel. Although the rent–at 8,500 Philippine pesos a month–is somewhat pricey compared with her old store, “the location is great for pulling in walk-in customers,” she said. Soon after she agreed on a lease in early January, Ms. Imperial installed an electric fan, mirrors and a wash basin retrieved from her old shop. She also bought a small generator for the lights using money borrowed from a friend. She used the electric fan to dry customers’ hair at first because she no longer had blow dryers (though she later bought some supplies during a trip to Cebu). Yet almost immediately, the new New Rose Salon was pulling in clients as word spread that Ms. Imperial was back in business. “Maybe it’s because I don’t charge ‘Yolanda prices,’ ” she said, referring to large markups that some other businesses have resorted to since the storm, which is known locally as Typhoon Yolanda. —Tammy David contributed to this article. Such an inspiring story of Filipino hope and perseverance! As women, we all know the power and confidence that beauty and wellness contribute to one’s self. Tammy had a brilliant idea of helping out Aling Rosita by donating our unused beauty tools and products. She is planning to send out a box full of these precious products to Tacloban. The response has been overwhelming with just a few posts on facebook and now we are taking this to you, fellow glossy girls! If you want to continue to help to the rebuilding of Tacloban after the devastation of Typhoon Haiyan, consider putting together your unused beauty products or old but working styling tools such as hairbrushes, hair dryers, curling/straightening irons, etc. Subscribe to comments with RSS or TrackBack to 'Glossy girls, unite! '.